By Eugen Dühring. 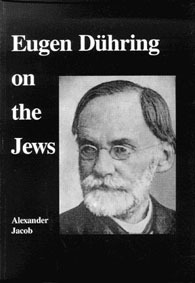 The philosopher Eugen Dühring was one of the most outspoken writers of the 19th century. His book, The Jewish Question: A Racial, Moral and Cultural Question with a World-historical Answer, was one of the most candid and thoughtful works ever published concerning the nature of Jewry. This is a translation of this remarkable book, as well as an analysis of Duhring’s political views. P/B, 228pp.